I heard the words I never wished to hear again; “Your Mother has had a brain bleed. We recommend she be transported to the Thomas Jefferson University Hospital of Neurosciences and……”. I am sure he went on but that was all I heard. Flashback to my father, lying on the stretcher in the Abington Hospital’s emergency room some 16 odd years ago and hearing those words for the first time…”Your Father has had an aneurysm. There is a subarachnoid hemorrhage…..”, and again they go on with pertinent information only partially retained. Unfortunately, my Father never made it out of Abington Hospital. The city? As a suburban girl, the city means only two things to me; theater or a medical conference. These are the only reasons one should risk or venture into the big, scary city. To me, the city is a twisted mass of high rises blocking the sun, a jig saw puzzle of one way streets and walkways that belch up sounds and smells of the deep, underground subway. After admitting Mom for care and realizing this was going to take time, I decided to find a hotel within walking distance of the hospital. I knew this would minimize the trauma of having to drive back and forth from the antithesis of all things pleasant. The Hilton Doubletree Hotel was the rushed decision I had made. While securing my reservation on the phone, I gave the operator a special code for people with someone in the hospital. That is when the mundane attitude of the agent changed…”Mrs Byard, is a loved one in the hospital?” I shared that she is indeed and before we hung up, she wished my Mom a speedy recovery. That night, tired after having walked the streets of Philadelphia and having navigated the medical system of an unfamiliar hospital, I ordered my dinner from room service. A sweet gentleman delivered the meal within the promised amount of time. As I signed the check, I voiced how appreciative I was that they had room service. I then mentioned that my Mom was being treated at Jefferson University Hospital. He authentically shared his concern and asked if there was anything else I needed. I told him that there was not but that I appreciated his thoughts. Still heavy with the unknown, I awoke the next morning, showered, dressed in one of the three outfits I THREW together in a hurry and quickly rushed out the door to stay with Mom in ICU. 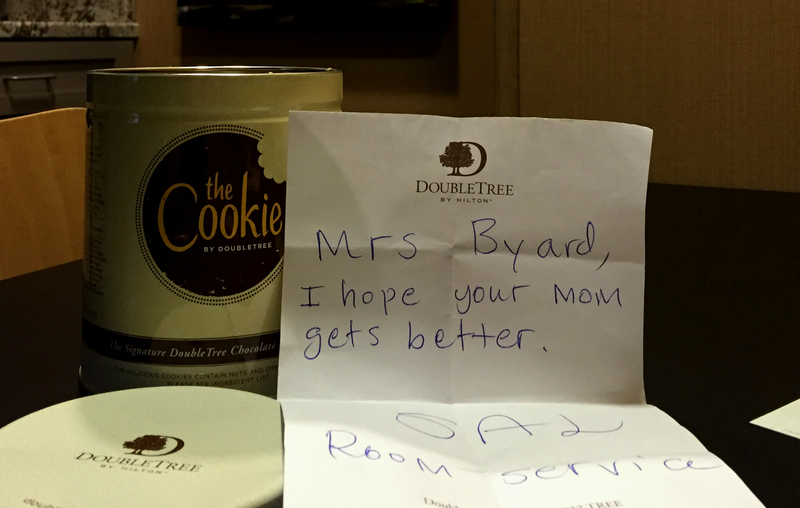 As I opened the door, I noticed that on the outside was a Doubletree bag with a tin of their famous chocolate chip cookies within and a hand written note from the man that thoughtfully delivered my meal; Mrs Byard, I hope your Mom gets better. Sal. Room Service. That night I ordered my dinner from room service again. The clothes I had thrown together were not suited for a restaurant within the theater district. The same sweet gentleman answered the phone and took my order. I told him how much the cookies meant to me. When he delivered the meal, he made sure there was an extra dessert and two unordered bottles of water which he placed in my room refrigerator “for later”. So, as I sit and write this out, I wonder again…Is there exemplary customer service training at this hotel? Do they provide compassion training for their staff? Or, is there just extraordinarily nice people out in the world and the Angels aligned for me during this time to make the journey easier? As an employee in a veterinary practice, I also wonder, how can we manage the same sort of compassionate service? We tend to be very compassionate with our patients but often take a sideways glance from the pet parent as judgmental instead of wondering what their story is and how can we be of service. By staying in a center city hotel, I was spending money I didn’t plan on spending, I was missing work and I was worried. These are also all concerns that crop up when someone’s cat blocks for the third time, when the puppy runs out of the house and accidentally sustains injuries when hit by a car, or when the older dog presents in seizure for the first time. We often get defensive when they mention how expensive veterinary care is. Well, the reality is; it is expensive, they weren’t prepared for it and they are scared. Just as I was. This is a reminder to me and hopefully you, that there can never be too much empathy. The Hilton Doubletree Hotel hit their mark on so many levels. By entering the special code into their system, the entire staff was alerted that this customer was not a tourist nor on a business trip. This was a person that needed special attention. Their concern made me feel safe when all things in my life felt anything but safe.